So What Is The Ebates App? Ebates is a free app (and a website) that will give you cash back on everything you buy online. In other words, it’s a dream come true for anyone trying to save money, and cut costs. And that’s almost everybody. I started using Ebates just one month before writing this, and I’ve found that Ebates has an agreement with thousands of different companies, that will pay Ebates everytime an Ebates user buys through their stores. Ebates will then share some of the commission with you. This is how Ebates gives a buyer extra money back. In other words, if you want to buy something, you can go to your Ebates browser, and then shop Amazon, Walmart, Macy’s, American Eagle, or thousands of other stores, and it will give you 3%, 5%, 10%, or even 30%+ back on what you spent, just for going through Ebates first! It’s 100% FREE to use! You just make money back on what you’re buying anyway. Buying from Bed, Bath & Beyond will give you 4% of the price of whatever you purchased. A purchase at Overstock will give you at least 8% on the furniture you buy. 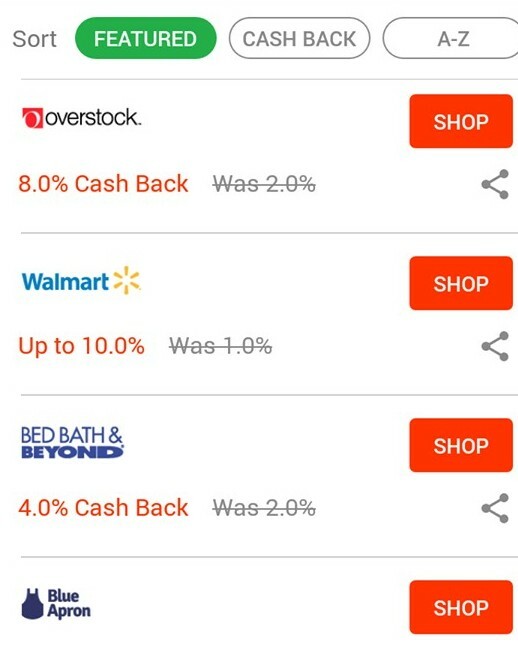 Ebates will give you up to 10% of what you buy at Walmart! And the list goes on. Ebates Is Not The Same As Getting Discounts! Ebates will alert you about discounts from hundreds of stores, but the cash back you get from Ebates is in ADDITION to what you can save from sales and discounts. This means that if you find great sales, or have additional coupons, you can combine them with Ebates to spend less AND get money back. Here is a screenshot of my first pay from Ebates, after having the app for less than a month. As you can see here, I got the app in late January, and by late February I had received almost $20 from Ebates. Granted, this includes the $10 bonus that I got signing up through this link. But with only 3 small purchases I was able to make some decent money back! The trick is just remembering to shop through Ebates before you buy anything you need. To make sure you remember, you can download the Ebates Cash Back Button, which is an extension that you will see right next to your browser bar. With the Cash Back Button active you don’t even need to visit Ebates first! Just do your shopping and Ebates will automatically credit you your money. While most cash back rates are usually between 2% and 10%, you will sometimes find deals that are much higher! I bought a bouquet of flowers for my wife on Valentine’s Day from Florists.com, and got about 30% back. That’s $8.40 on a $30 purchase! You will find especially great deals like this around holidays. Ebates pays you quarterly. That means you’ll get the money built up in your account every few months. They’ll pay you through checks, or PayPal, and if you ever find that you didn’t get credit for a purchase you can go HERE and they’ll track it down for you, and make sure you get paid. 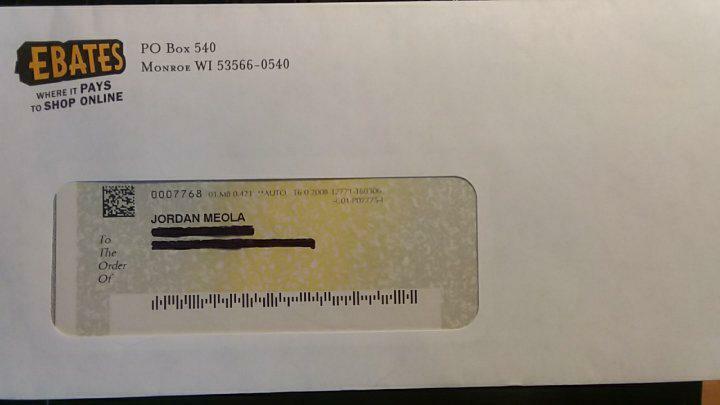 It’s pretty nice checking the mail and randomly finding a check I got just for doing Christmas shopping for my family! It’s a pleasant surprise that paid for a night out at the movies for two. If you want to start getting REALLY good money coming into your Ebates account consistently, you might want to consider moving some of your regular purchases to Ebates as well. In other words, if you have ever considered grocery shopping online, purchasing your Dish connection, Norton antivirus for your computer, tax preparation, magazine subscriptions, or many other living expenses, you can get money back from Ebates on TONS of this! You could easily go from making $10-$20 back each month on occasional purchases, to making $50-$100. It depends on your shopping habits, but the more you shop online, the more Ebates will be a money maker/saver for you. Every time you refer one of your friends to Ebates and they start using it, Ebates will pay you another $15 for each one of them! Yup! 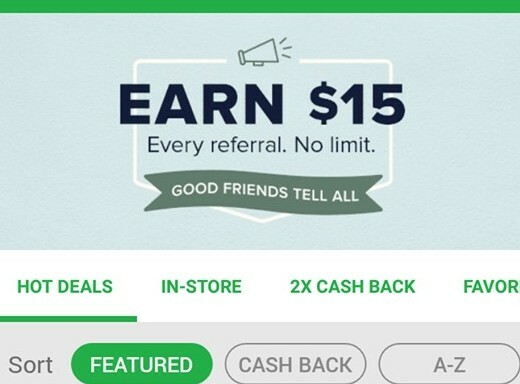 Just let your friends on Facebook, Twitter or anywhere else know about Ebates and how it’s been saving you money, and you’ll get another $15 every time! What Stores Are Available On Ebates? There are hundreds and hundreds of stores that you can buy from that will qualify you for cash from Ebates. …. You get the idea! There are TONS of stores that you can order from. Most of these stores only offer cash back for online purchases, but many of them even offer this for in-store purchases. Sign up for this free cash back program by clicking on this image below. As long as you use Ebates you can get a $10 bonus just for the sign up through this link! Once signed up you can also download the app for iOS (iPhone) or Android if you want it mobile, for in-store coupons, scan for price comparisons, and updates on your money. There are lots of other awesome apps and websites for saving money, or that will give you money back on your purchases! 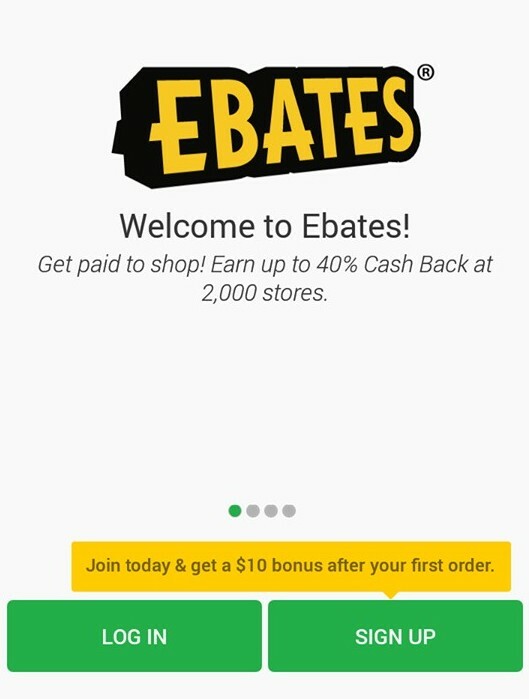 Ebates is one of the best, but check out this list HERE to find another great app that I’ve used to save me $20 per month on groceries! If you’re looking for a way of actually building income online, you may want to read THIS. The internet is full of opportunities to break free of the paycheck-to-paycheck cycle. Thank you for your informative post. Its my first time to hear about the Ebates App. I wish I had known about Ebates a long time ago. By now, I could have made some great savings. I have bookmarked your post for future reference. Please can you explain if I need to register for an account to start using the Ebates App? Hello Zegu, I’m glad you found it helpful! You can sign up online and then download the app, but I believe you can also just start by downloading the app first, and signing up through that :). 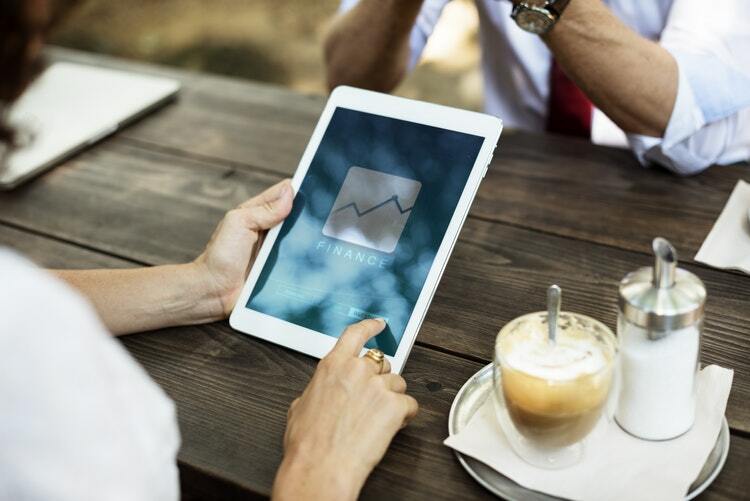 It’s useful to have it both on your laptop, and on your mobile devices, so wherever you end up doing your shopping it will be giving you money back. Thanks for dropping by! Please join through my link if you’re interested. You’ll also get a $10 bonus from Ebates once you start using it. I have seen advertisements for ebates but I was always afraid to take the risk to join the website and give it a try. After reading your article I am feeling more positive about giving ebates a try, you seem to be happy so far as a member so maybe I will give it a try also? Yes, Ebates is definitely worth it, and it’s really not a risk, there’s no cost to using it at all. It will just give you money back for any of your online shopping. Even things like starting a cell phone plan, or getting plane tickets. Thanks for putting together this informative post i had always wondered about this and was it true do the really give you back money from buying through them well i for my answer and I love sales plus all the places you listed i might just sign up for this Great Post! It’s definitely worth it – it’s totally free, and really easy to use. They send you the check automatically., and itcan really help cut down what you end up spending online. You can alsocombine it with other deals! Let me know if you have any questions. That is awesome that you were able to earn $20 in a month for purchases. I do make online purchases now and then and am looking into this as a possibility. Do you find the shopping interface easy to use? At the end of the day how much can you earn, if you don’t do much online shopping then I guess you won’t be getting much cash back? Hello SJ! I’m glad you found it helpful. Yes, Ebates is really easy to use. You can just log into it like any other website, and then go to Amazon or any other online store right through Ebates. To make it even easier you can just get an extension through the site that will then be attached to your browser bar, so it will give you credit for your purchases even WITHOUT logging in through Ebates. 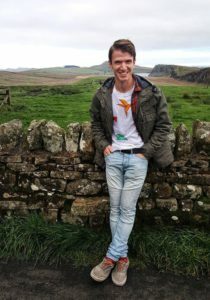 I don’t do much online shopping either, so it really won’t rack up to lots of money each month, but if you can make more of your shopping online it will really help. Especially around Christmas time if you buy gifts for your family. There’s no limit to how much cash back you can get, it’s just relative to how much you shop online. That app is great! Thanks for posting it and sharing your experience! It seems Amazon doesn’t give much cashback though but it’s worth becoming a member as even if it’s little, if you do lots of shopping in the end of the month it’ll be worth something. It’s also great they are expanding and getting more shops on board, with the unstable economy and low pays nowadays every penny counts! Yes! Similar to apps like Ibotta, or the Gold Status loyalty program I use for Shell gas station, it’s really about saving everything you can on expenses that you already have. Each of these things may seem small in of themselves. Cash back on some groceries through Ibotta. 3% return on your Amazon purchases through Ebates, or $0.05-$0.15 off per gallon at Shell. But over the course of a year I save at least $200 EACH! Having an extra $600 in my pocket just by using some free apps is a pretty good deal! I saw commercials for Ebates on TV, but otherwise would not have known about it. You’ve provided some great information about it. I wondered if it would be worth it and if you would have to spend a lot before saw discounts or money back. I’ll have to check this out when I get a chance. Thanks for the information! Hey Kevin, thanks for commenting! Yes it’s been around for a little while now. The amount you’ll earn off of Ebates is really dependent on how much shopping you do online. It’s not for the purpose of making money, really. It’s for the purpose of saving, or getting as much money back as possible. 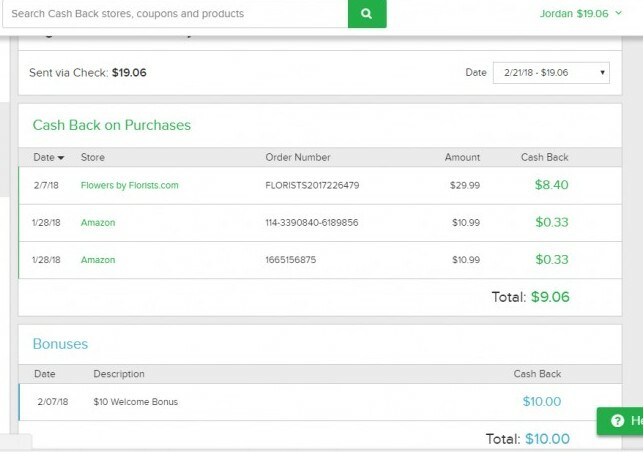 Some of the cash back amounts are fairly small, but as I mentioned in the review, Florists.com for example gave me 30% of the cost of flowers back to me. So these add up over time. Ultimately, it’s just nice getting that surprise check in the mail every few months, after doing some shopping online. It’s free, so it’s worth the shot! Hey Arta, thanks for the comment, I’m glad you found it helpful! To your first question, once you’ve joined Ebates just google the cash back button and it should lead you to it. It will work automatically when you shop once it’s activated. Just a note though: it’s not an option for mobile, at least not yet. Also, it’s 100% free! There’s never a cost or an upsell or anything. It just pays you back on shopping you do online. The only thing is if you never shop online you’ll never make money with it. I have been using another cash back app called Top Cash Back. I am thinking of trying Ebates. My current App can only be used online. I have always received payments for all my purchases but some of them take a long time for them to verify and credit to my account. How long does it take for Ebates to credit a purchase to your account? Hi Lisa, thanks for commenting! I have heard of Top Cash Back, and have heard that it’s especially popular in the UK. It’s definitely good, from what I’ve read. Ebates and Top Cash Back are comparable. Ebates gave me credit in my account within 24 hours of purchasing each item. They do, however, only send out checks on a quarterly basis, or about 4 times per year. So it accumulates over time and then sends out every few months. For somebody who loves to shop online, shopping through Ebates is indeed a great way to get some of your cash back. I wish I would have known about this before but oh well … it’s not yet too late. I will definitely check this out and and share it with my friends, thanks for the info. Thanks for dropping by Alice! Yes, Ebates isn’t going to make you rich, but it will save you a lot of money over time, on the shopping you do online. You can purchase almost anything online, and the more you do through Ebates, the more money you’ll be getting back on your expenses. I’m glad you found the info helpful! I’m glad you found my story and experience helpful. Ebates is a simple app/website, but it can be really useful for saving money on anything you buy online. Even antivirus software, website hosting (you can get up to $50 back on Host Gator for example), and getting a new phone (you can get $75 just for starting up with Verizon or AT&T). Pretty cool! Come back any time for more info on saving, and thanks again! Ebates is a great way to earn some extra income! I use it regularly and even have the Ebates Shopping Assistant downloaded on my home browser so it “pings” me when I am on a site that has a partnership with Ebates. Great review and I’m glad you are sharing this cool tool for those that are already buying things online. That’s a really useful tool, I’ve been able to use the Shopping Assistant a little bit as well, and it makes the shopping + discounts process really easy. I don’t even need to think about Ebates before shopping, it follows me along. First of all I just want to say I love Ebates! I usually always shopped in store but now I am able to go look at the things I like in the store and then purchase them online for a rebate! Internet shopping has exploded and even the older generations are moving in this direction. How can I get some of my friends and family to sign up without giving them a sales pitch. It all sounds great but if they don’t take the action to get involved then they can never benefit from it! Hey Ernest, I’m glad you found it helpful! Ebates is super useful, I agree. Really anything that will save you money on your existing expenses is pretty great. As far as pitching it to your friends and family, it’s a super soft sell because it’s 100% free. Literally the only thing you’re suggesting they do is get money back on their online shopping. I think that thousands and thousands of people who complain of financial woes could have saved themselves all the trouble by taking action when they had the chance. I’m glad you’re using Ebates! Great article on Ebates. I’ve been using Ebates for 2 months now and it’s amazing how quickly the cash back money adds up. The one thing you have to be careful about are shipping and handling fees which sometimes can be more than what you’ll earn from Ebates. Between Ebates and Ibotta, shopping is definitely a little more fun. I’m glad that you’ve found Ebates helpful! Ebates and Ibotta are by far two of my favorite apps for saving money on regular purchases. Shipping costs can sometimes be a negative factor, although many times they don’t apply, such as a purchase of $25 or more through Amazon. Ebates REALLY becomes valuable for things that are a little less expected. You can get $30 back on your website hosting through HostGator. Up to $75 back on your phone bill through Verizon. And many other things like that. It definitely makes shopping more fun! Thanks for commenting! Hopefully this is helpful to you.